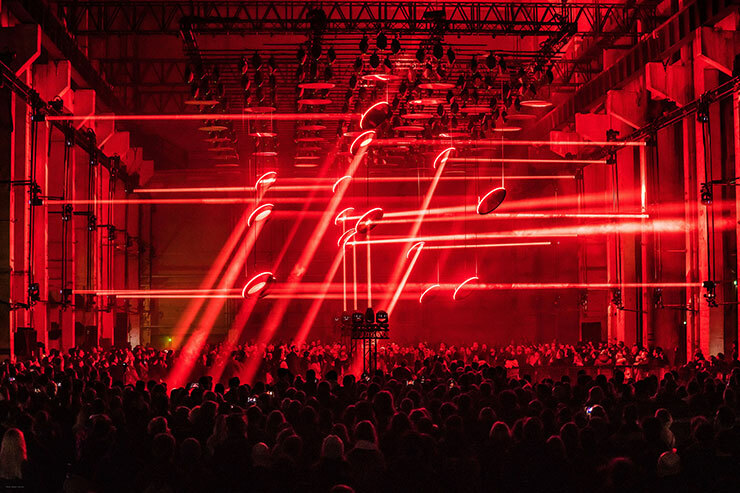 “SKALAR” is a large-scale audiovisual installation by Christopher Bauder and Kangding Ray that explores complex impact of light and sound on profound human emotions. 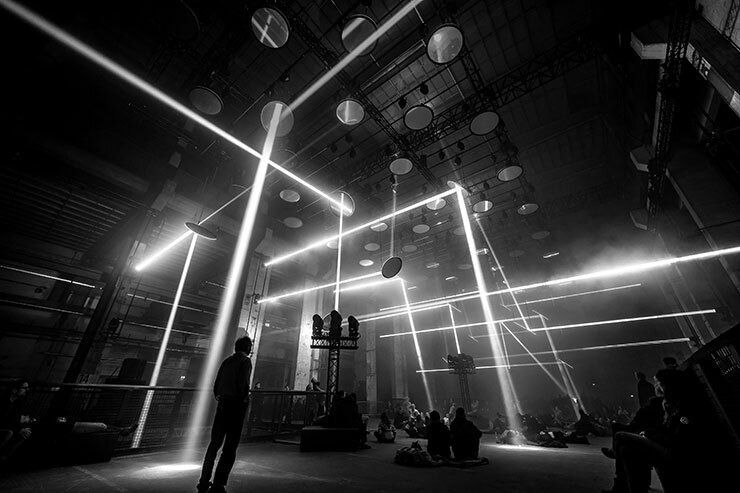 This artistic venture was first hosted by CTM Festival at Kraftwerk in Berlin in 2018. Christopher Bauder, an artist and designer working in the fields of light and installation art, media design, and scenography, focuses on translation of bits and bytes into objects and environments, and vice versa. In 2004, he founded the multidisciplinary art and design studio WHITEvoid which specializes in interactivity, media, interior architecture, and electronic engineering. 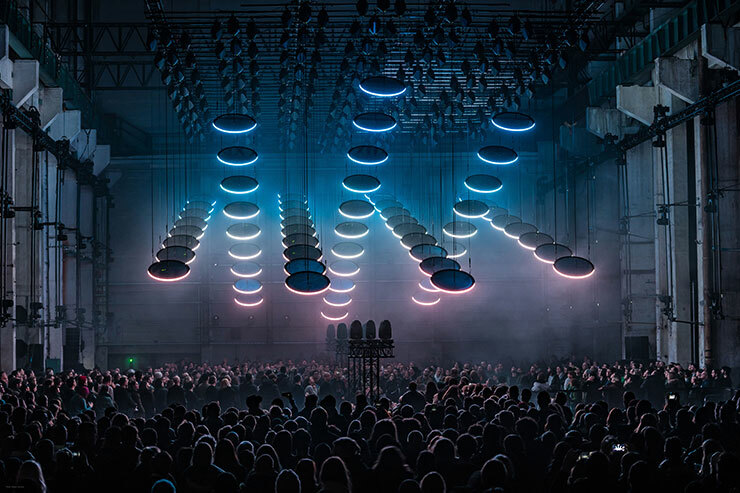 “SKALAR” is a central piece within Bauder’s body of work, a large-scale interpretation of light and darkness as endless cycles of day and night that define our perception of time and influence our emotions. The installation is a gigantic collaborative piece and a result of enormous teamwork. Bauder’s endless fascination with light allows him to treat this intangible means as a solid material, sculpture and shape it to architectural dimensions, evoking abstract emotional associations of the viewers. Although Bauder’s artwork applies complex technology, first and foremost, it discusses fundamental human feelings and universal beauty, clear and comprehensible to audiences of all ages and backgrounds. The concept of “SKALAR” is based on Robert Plutchik’s psycho-evolutionary theory of emotion that considers eight primary emotions — anger, fear, sadness, disgust, surprise, anticipation, trust, and joy. 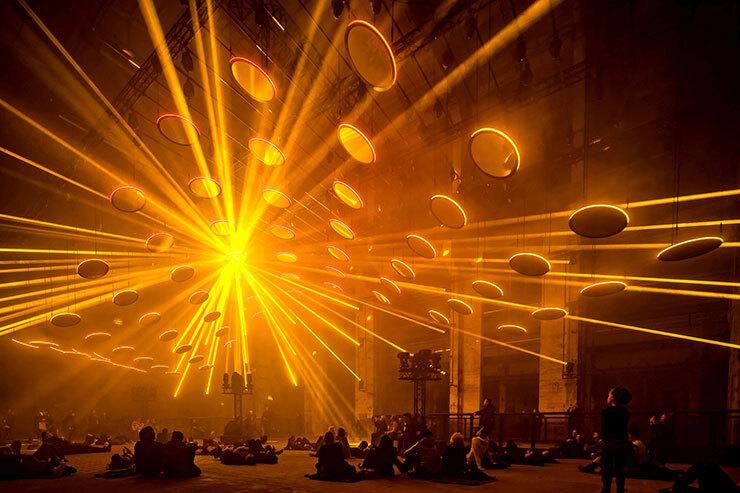 Bauder chose to provoke these emotions by a combination of motion, light, and sound. 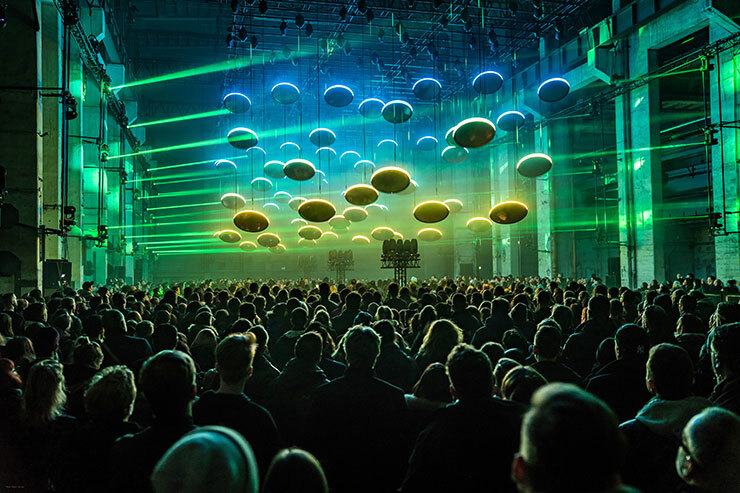 The massive light installation was enhanced by electronic music from composer Kangding Ray, whose deep exploration of synthesized sound and rhythm resonate with Bauder’s passion for artificial textures in space and music, and reinforce his awe-inspiring artwork. 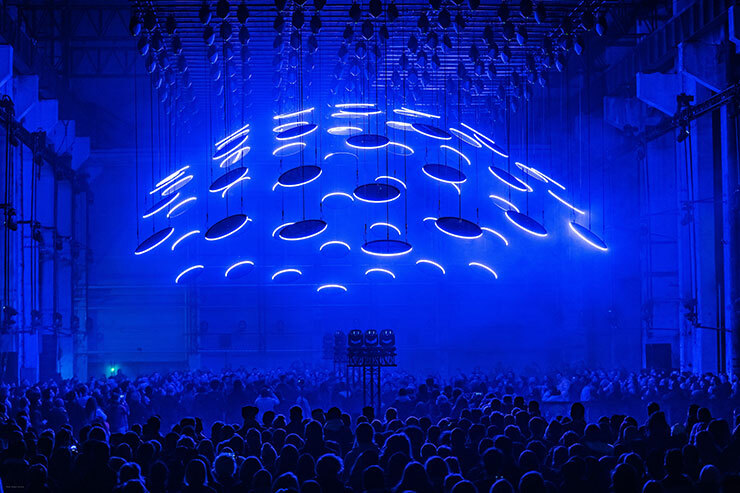 Measuring about 45 m in length, 20 m in width and 10 m in height, the generative luminous structure encompasses a perfectly synchronous interplay of 65 motorized mirrors, 90 moving lights, and a multichannel sound system — elevating creative possibilities to a whole new level. 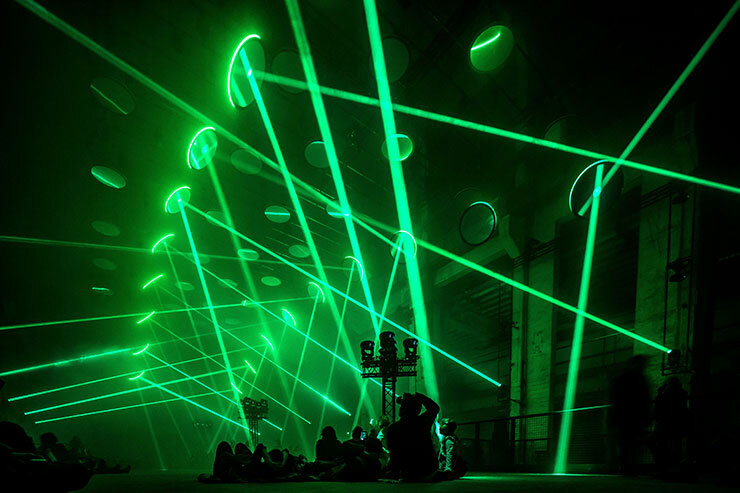 “SKALAR” was installed at Kraftwerk, Berlin’s former power plant built around the same time as the Berlin Wall. 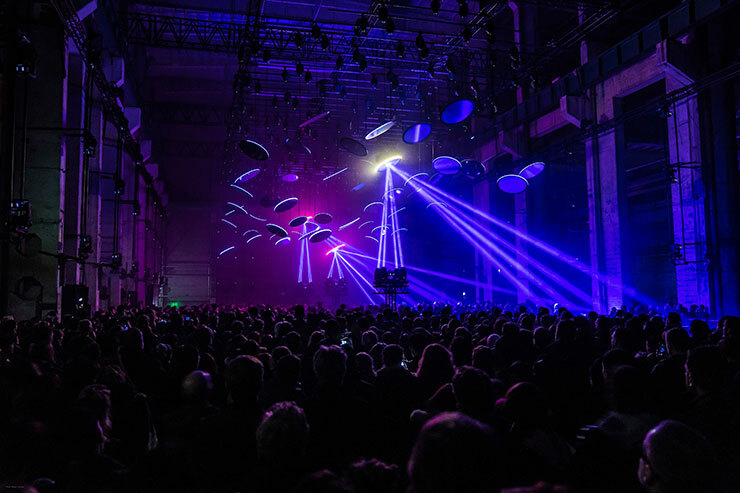 The industrial building stood abandoned for many years before Dimitri Hegemann gave it a second life by opening a space for carefully curated large-scale artistic projects and Berlin Atonal, the annual festival for experimental electronic music. 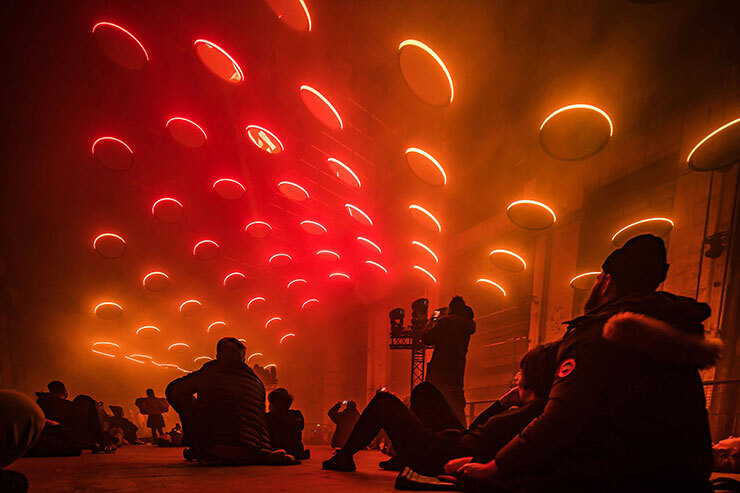 The space itself allowed the 45.000 visitors of Bauder’s massive light and sound sculpture to immerse into a mystical atmosphere and experiment with their senses — whether wandering around the massive concrete building filled with otherworldly light and music, sitting next to loudspeakers, or lying on the floor under the artificial sun. From the production side, “SKALAR” is made possible by the technical expertise and support of three main partners. 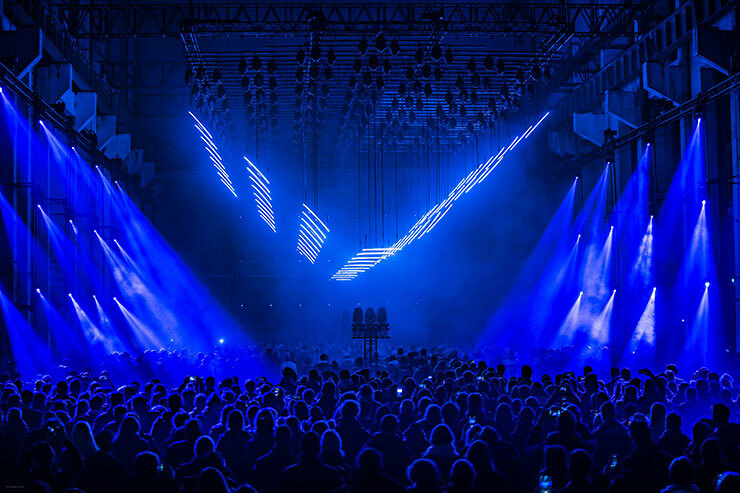 The art and design studio WHITEvoid managed the project’s production and provided custom software development, KINETIC LIGHTS offered its high-performance precision motor winch systems, and ROBE lighting ensured the highest quality in moving light technology: ultra-sharp and homogeneous parallel light beams that can hit accurate positions with repeated precision and perfect colour consistency across 90 devices.